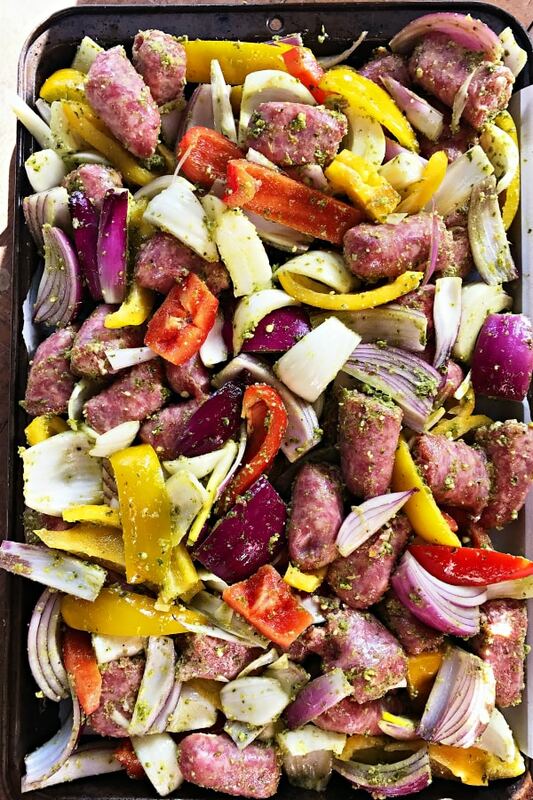 Simple hospitality Pesto Bratwurst Sheet Pan Dinner for drop-in guests, a potluck dish, or an easy weeknight supper–made with brats, peppers, and onions. Friends, I’ve been making sheet pan dinners for years, but just didn’t call them that. 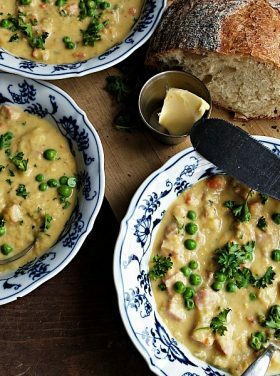 But seriously, they are my go-to dinner when I don’t have a dinner plan. 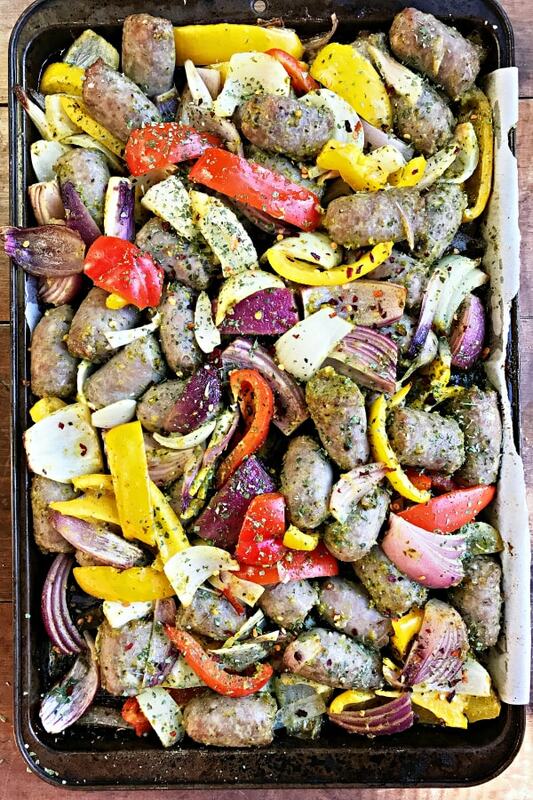 You can add a variety of vegetables, or meats, (Roasted Bratwurst Potatoes & Peppers), and spices, like in this Pesto Bratwurst Sheet Pan Dinner–so good! Visualize with me that you just found out guests are stopping by … right at dinner time. Has that ever happened to you? Will you be prepared to make something in case they want to stay for dinner? 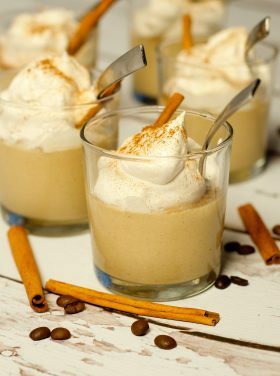 Everything in this recipe, I usually have on hand. It’s simple, a quick meal to prepare. 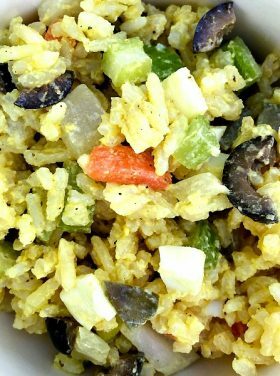 Serve with a side of brown or jasmine rice! In fact, when I shop at Costco, I always think ahead to whether I have these ingredients at home (beautiful bell peppers, red and white onions, pesto, rice, and brats). Prepare the Pesto Bratwurst Sheet Pan Dinner and set aside until ready to bake! When guests arrive, place the baking pan and rice on the counter and let guests serve themselves. You can even add dressing or sauces to put on top! I also like to serve a nice rustic loaf of French bread with butter! If you’re short on time, just serve water! But if you can, pull out a chilled bottle of wine from the fridge. 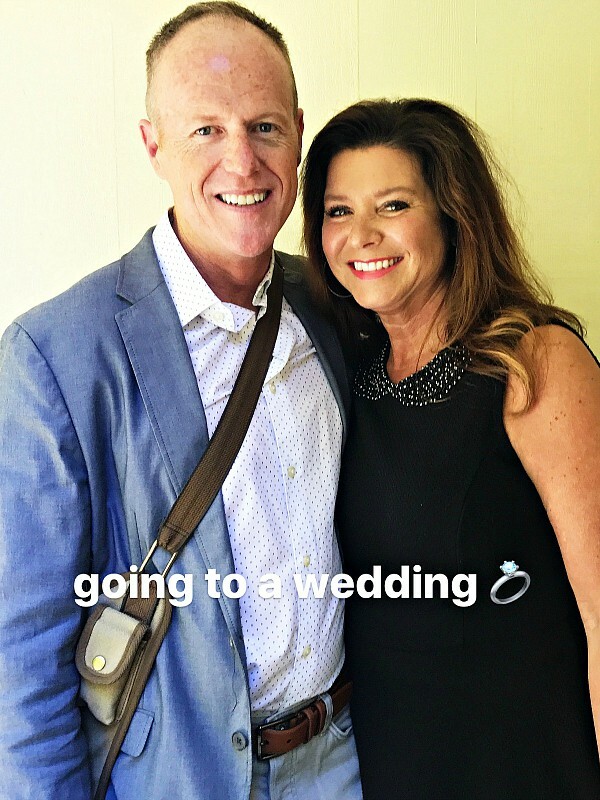 This past weekend we went to Portland for a wedding. 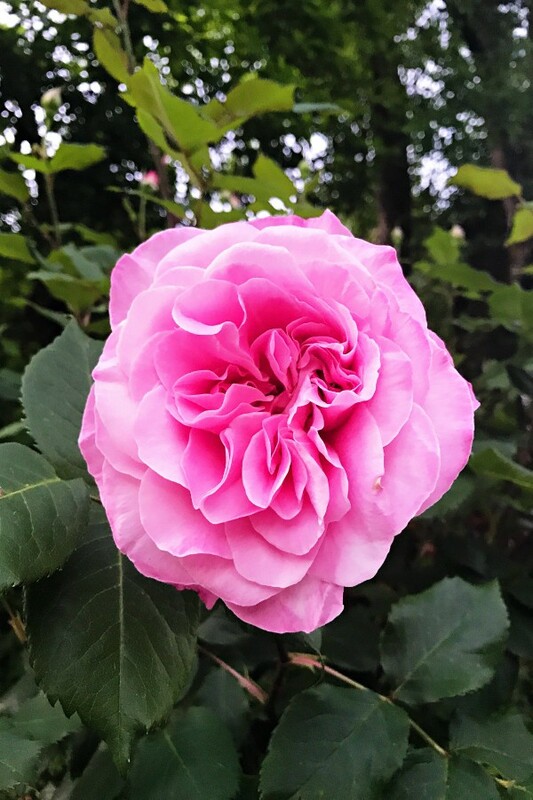 The flowers are incredible in the pacific northwest right now, so vibrant and lovely. 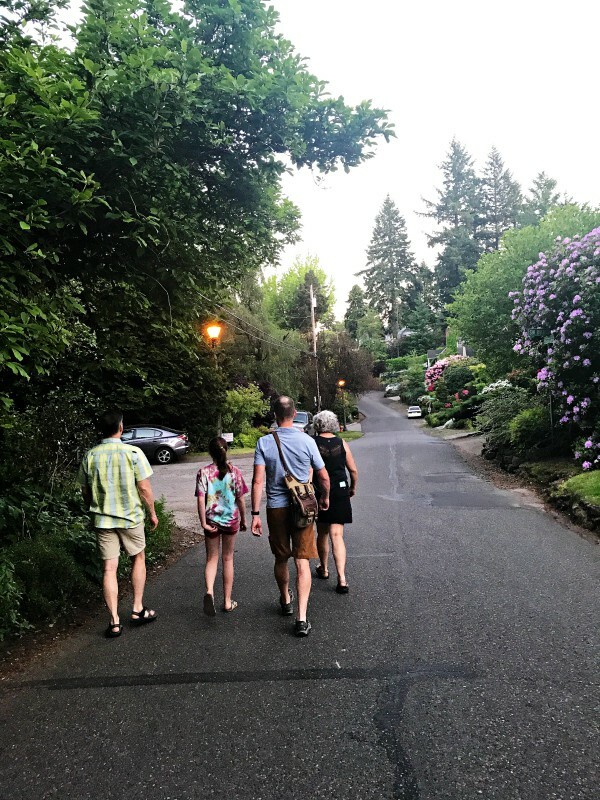 We walked to dinner one night, and the colors were just amazing! Flowers remind me of my friend, Steph. She’s the best kind of hostess, even for last-minute company and for sure overnight company! She never says no, and she’s always ready. Very inspiring. 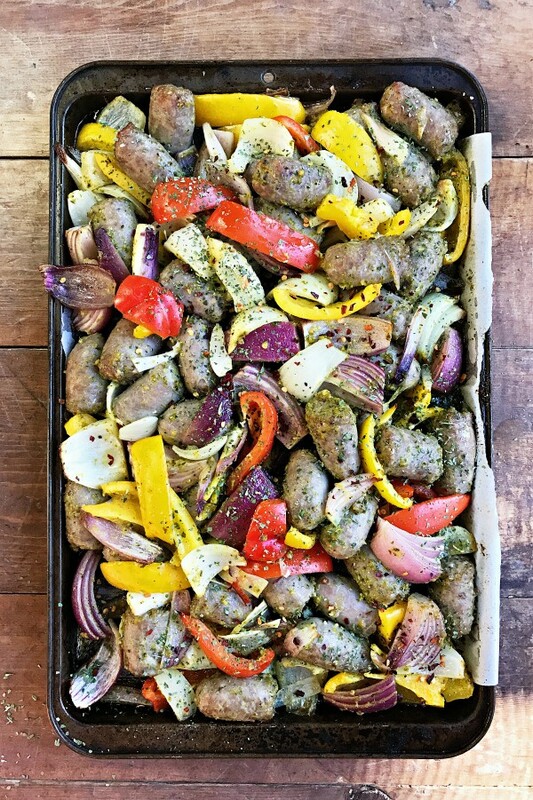 I hope you enjoy this Pesto Bratwurst Sheet Pan Dinner this week! Come back and let me know, and remember you can always the seasonings with your favorite spices! In a large bowl, add all the ingredients together (except dried basil and red pepper flakes). Heat pesto in the microwave for about 1 minute. Pour over the mixture; mix with hands. Pour onto the large baking sheet. Cover with foil and bake for 35 minutes. Remove foil and cook an additional 10 minutes. Sprinkle with dried basil and red pepper flakes (optional). Serve right in the pan, with rice as a side! More sheet pan dinner ideas: My friend, Heidi, shared 31 Days of Sheet Pan Dinners in May, Sheet Pan Chicken Parmesan [Cookie Rookie], Sheet Pan Pizza [The Baker Mama], Sheet Pan Fajitas [Wine & Glue], most popular blog on RE, Paprika Chicken Thighs. Yum. Sounds good! I love bratwurst. I love one pan meals. lol. 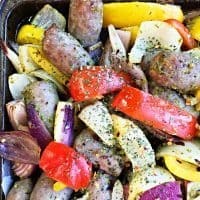 On Saturday I put together some polish sausage, chopped veggies, and potatoes in a large pan. Then made a side of scrambled eggs to eat along with it. So yummy and satisfying!